Oops - we don't appear to have a video for the fi-4010CU. 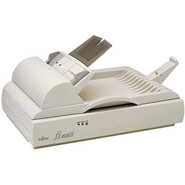 The Fujitsu Fi-4010CU document management scanner has a USB interface enabling easy installation with PC's allowing you to scan and store documents with ease. The Fi-4010CU is supplied with a couple of industry standard software packages to enable the most productive use of the scanner straight away. Adobe Acrobat - Converts scanned images directly into PDF file format, the new standard for document distribution or space efficient electronic filing. Abbyy FineReader - A highly accurate and effective Optical Character Reader (OCR) package, which will convert scanned images from the Fi-4010CU into text for incorporation with your own documents.